More than 650 conservation practitioners and policy makers from across North America met at the National Workshop on Large Landscape Conservation on October 23-24, 2014, in Washington, DC, to share ideas on the challenges and opportunities that lie ahead in implementing landscape conservation, as well as to explore the most effective tools, strategies, and science available to inform landscape initiatives. 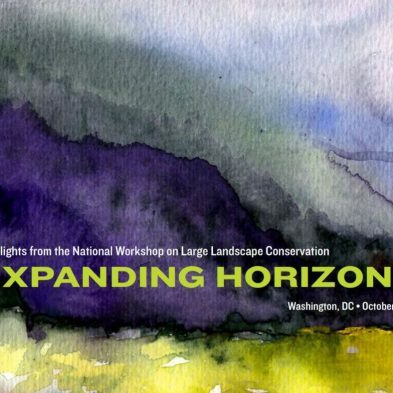 The ideas and energy from the National Workshop were captured in Expanding Horizons: Highlights from the National Workshop on Large Landscape Conservation. This report was developed by QLF Atlantic Center through a cooperative agreement with the National Park ServiceStewardship Institute. A follow-up webinar was convened and is viewable here to discuss outcomes and leveraging the momentum of the National Workshop. How can mitigation at the landscape scale foster land conservation and economic development? How can we effectively invest for measurable results and environmental resiliency in the context of climate change? How can we, across the continuum from urban areas to wilderness areas, engage diverse communities in the green spaces outside their doors? How can we leverage advanced technologies and innovative financing tools to dramatically advance the practice of large landscape conservation? Welcome and Introduction to the National Workshop. Joel Dunn, Executive Director of the Chesapeake Conservancy; and James Levitt, Fellow, Lincoln Institute of Land Policy and Director, Program on Conservation Innovation, Harvard Forest, Harvard University. Plenary Remarks – The Council on Environmental Quality and Large Landscape Conservation. Mike Boots, White House Council on Environmental Quality. Plenary Remarks – Working Together. USDA Secretary Tom Vilsak and Deputy Secretary Krysta Harden. Panel Discussion – From National Leadership to Regional Coordination and Local Implementation. Moderator: Jim Levitt. Elizabeth Rooks-Barber, Partnership Coordinator, Land Trust Alliance; James W Hourdequin, Managing Director, Lyme Timber Company; Lynetta Usher Griner, Usher Land & Timber Company; Greg Wathen, Coastal Plains and Ozarks Landscape Conservation Cooperative. Keynote Address – Secretary of the Interior Sally Jewel, United States Department of the Interior. Plenary Remarks – Large Landscape Conservation – Who Really Gets it? Jim Geringer, Director of Esri & former Wyoming Governor. Day Two – Call to Order. Douglas Austen, Executive Director, American Fisheries Society. Opening Comments, Day Two. Sid Jamieson, Iroquois Confederacy. Plenary Remarks – The National Wildlife Federation and Large Landscape Conservation. Collin O’Mara, President & CEO, National Wildlife Federation. Roundtable on Large Landscape Conservation in Metro Areas. Gerald Adelmann, President & CEO, Openlands; John Rogner, Upper Midwest and Great Lakes Landscape Conservation Cooperative Coordinator; Dr. Mamie A. Parker, President, MA Parker & Associates; Former Assistant Director, Fisheries and Habitat Conservation, USFWS; Arnold Randall, General Superintendent, Forest Preserve District of Cook County (Illinois); Chair, Chicago Wilderness; and Bruce Roll, Director of Watershed Management for Clean Water Services, Hillsboro, Oregon; Board of of Directors, The Intertwine Alliance of Watershed Management for Clean Water Services, Hillsboro, Oregon; Board of Directors, The Intertwine Alliance. Plenary Remarks – John Conger, Acting Deputy Under Secretary of Defense for Installations and Environment, U.S. Department of Defense. Plenary Remarks – Conference Synthesis. Lynn Scarlet, Managing Director, Public Policy, The Nature Conservancy and former Deputy Secretary, U.S. Department of the Interior; and James Levitt, Fellow, Lincoln Institute of Land Policy and Director, Program on Conservation Innovation, Harvard Forest, Harvard University. Like a large landscape conservation initiative, conference partners have come from the public, private, non-profit and academic sectors, as well as the American Indian community, crossing geographic and sectorial boundaries, to allow conservation practitioners, decision-makers and citizens to come together, share their best ideas and plan for the future. The following organizations substantial financial and in-kind commitments in support of the the National Workshop.